Hanoi (VNA) – More than 2,600 trees of over 100 fauna species in 52 province and cities have been recognised as heritage trees of Vietnam since the title recognition was initiated in 2010. Notably, many groups with big numbers of trees were honoured in 2015 and 2016 such as the groups of “po mu” (Fokienia) trees in Tay Giang district of Quang Nam province, Shan tuyet tea trees in Suoi Giang commune of Yen Bai province, and “nghien” (Burretiodendron hsienmu) trees in the Xuan Son National Park of Phu Tho province. 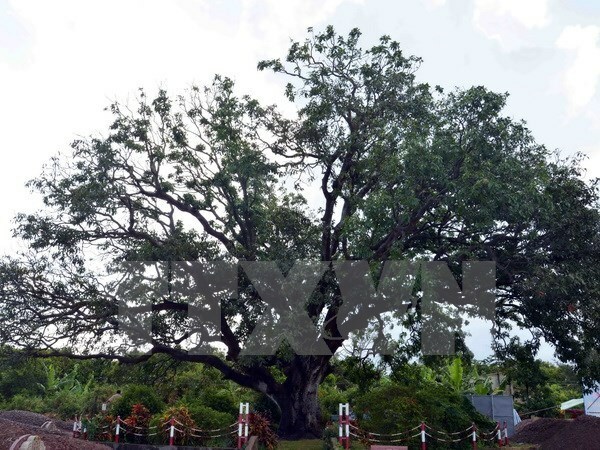 Dr Tran Van Mieu from the Vietnam Association for Conservation of Nature and Environment, which is in charge of the tree recognition, said the activity aims at both conserving biodiversity and highlighting historical milestones linked with the trees. The recognition of heritage trees helps raise public awareness of rare plant genetic resources and environmental protection, honours humanitarian values and pays tribute to ancestors who protected the trees, he noted. He said the recognition and conservation are an effective communication method, adding that ceremonies marking the recognition were held by the localities where the trees grow and in combination with local festivals, attracting large numbers of participants. Most of local administrations have been well aware of their responsibility, which can be seen through the establishment of boards for heritage tree and biodiversity protection. The engagement of persons with good prestige in the work has also encouraged local people’s involvement in environmental protection. To win the heritage tree title, a tree must be at least 200 years old in the case of wild trees, and at least 100 years for those planted. Moreover, the trees should be connected with the historical and cultural characteristics of the area where they grow.